To find the Hotel Particulier Montmartre, you must be well informed. Located between Avenue Junot and the famous rue Lepic, it is an exceptional place that we reach after crossing a few obligatory passages. That of the private alley that must be borrowed after ringing a large gate in front of which takes place a carpet of paving stones that must be borrowed. Then from this ultimate portal, after "the Rock of the Sorceress", which must be crossed to finally absolve the din of the city. Because here, in this former home that was a time possession of the Hermes family, we enter a world apart. Open to the public since 2007, the hotel has five suites, three lounges, a restaurant and a bar that the boss of the place, Oscar Comtet, manages masterfully. And it is in this kind of refined place that the meaning of words flutter and wander take their full meaning. That we land in the gardens of the Hotel which total 900m ² of greenery or that we take advantage of the cozy atmosphere of the refined à la carte restaurant, thought since April 2015 by Thibaut Spiwak (winner of the contest Escoffier and passed by the Georges V and Jules Verne), one feels at home and elsewhere and in an unusual temporality. So considering a night, or two, for pleasure in the establishment is clearly on its way. We can then crack for the Junior Suite "Vegetal" whose wallpaper was created expressly by Martine Aballéa. The view of the gardens and the warm light make it a beautiful island of freshness. If one is more velvet, the Junior Suite "Showcase" is also a serious alternative. For the "Curtain of Hair" Deluxe Suite, the European-style loft spirit is waiting for you to enjoy a breathtaking venue with a huge glass roof. The latest addition to the Hôtel Particulier Montmartre, the bar "Le Très Particulier" has been active since March 2015 with a quality program until 2am for the evening party of the most night owls. 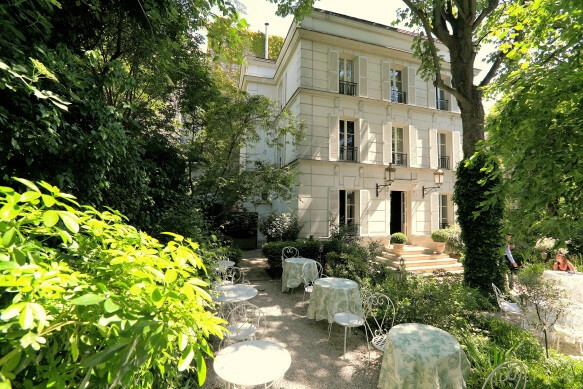 A popular address, the Hotel Particulier Montmartre is a reference for shootings, filming and other private parties. A must.